Summer is around the corner. There will be BBQs, cookouts, and get togethers. I always like to have a dip, a salsa, or a rich sauce that you can spoon over grilled proteins. This is just the sauce for all of that. It can be served with tortilla chips for dipping or with grilled chicken or broiled skirt steak. It’s also perfect as a sauce for tacos. This is a staple in my kitchen. I had a Mexican food themed dinner party last weekend and I served this sauce as a dip, and on the side for pork tacos. Hope you give it a try! Roast bell peppers until dark on a gas burner, broiler, or on the grill. Turn the bell pepper every few minutes, until the skin is blackened throughout. Place the bell peppers in a large bowl and cover with plastic wrap. Let rest for 15 minutes. Move bell peppers to a chopping board. Remove the blackened skin with paper towels. Cut each bell pepper in half, and remove the seeds. Be careful, steam can build up inside the bell pepper. In a blender or food processor, add bell peppers, jalapeño, garlic, lemon juice, sherry vinegar, sugar, salt, and pimentón. Process until smooth. With the motor running, slowly drizzle in the olive oil. Taste and adjust seasoning. You can add cayenne pepper to taste, if you would like for the sauce to be spicy. 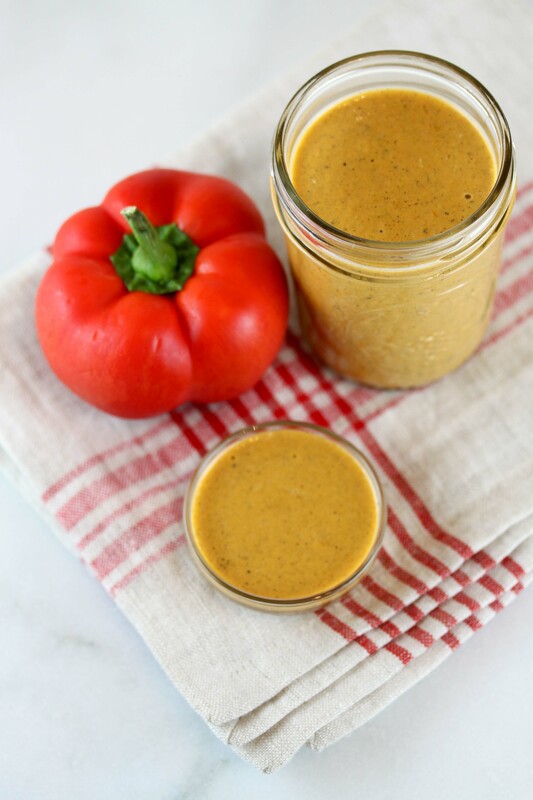 The sauce can be stored in a glass jar in the refrigerator for about a week.